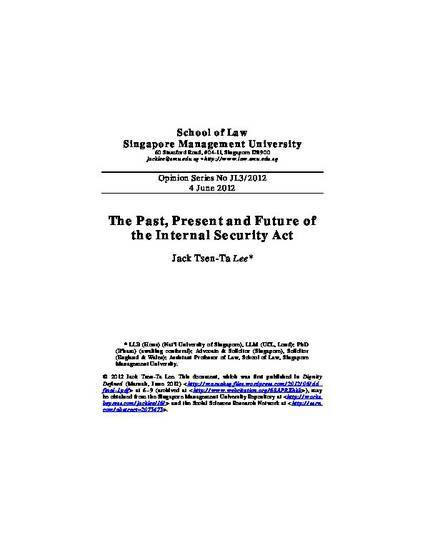 Assistant Professor Jack Tsen-Ta Lee, who teaches and researches constitutional and administrative law at the School of Law of the Singapore Management University, introduces the Internal Security Act (ISA) and assesses its continued relevance today. This document, which was first published in Dignity Defined (Maruah, June 2012) at 6–9 (archived here), may also be obtained from the Social Sciences Research Network. Jack Tsen-Ta Lee. 4 June 2012. The Past, Present and Future of the Internal Security Act. Singapore Management University School of Law Opinion Series No JL3/2012. Available at: http://works.bepress.com/jacklee/16.